Wallpapering Fog: Marketing's belief in social: Out of step? A survey has just dropped across my desk from Pulse Point Group and The Economist Intelligence Unit, that looks at how effective social media is perceived to be among 329 respondents from US and Canadian companies. Overall, results point to a strong faith in social. I say faith, because unfortunately there's not much evidence in the survey that anybody can prove their belief that social is tremendously effective. One chart jumped out as badly in need of turning the conclusion around and seeing how it looks with an opposite interpretation. This chart illustrates the leading current, and expected future advocates of social, by department. It's led by marketing. No surprises there. C-Suite is senior management for us Brits by the way. 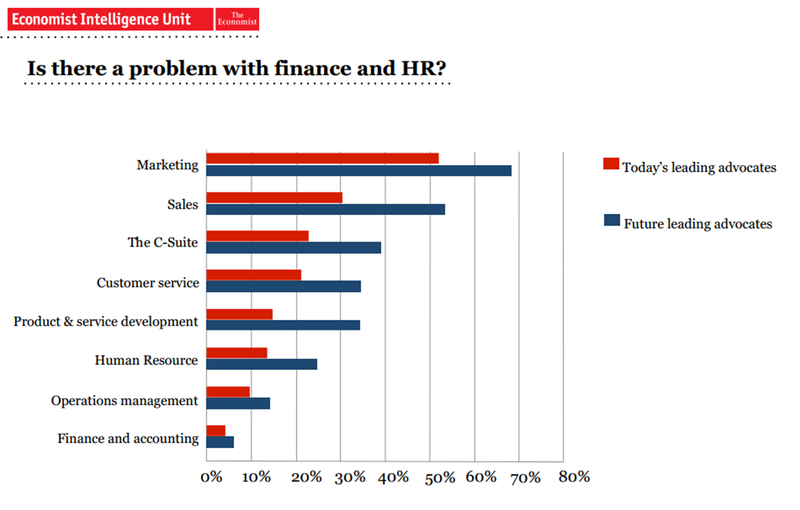 "Is there a problem with Finance and HR?" I'm going to look at it the other way. "Is it a problem, that marketing is so far ahead of the rest of the company in its belief in social effectiveness?" 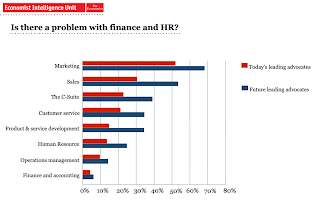 Asking if there's a problem with HR and Finance implies that Marketing is correct and that the other departments just haven't caught up yet. Marketing's belief in social is more than twice as strong as senior management's belief. Marketing's belief in social is ten times stronger, than the belief of those whose job it is to understand how much money the company makes and where that money comes from. At the very least, if marketing are right about social, then they've dramatically failed to persuade finance that they're right.